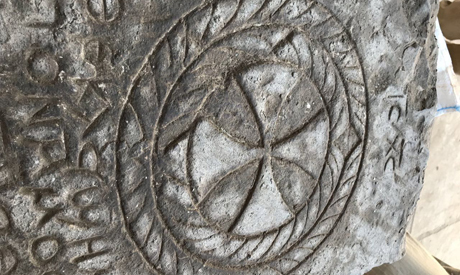 The study also found that the Coptic inscription found above the carved cross is an abbreviation for the name of "Jesus," Mostafa Waziri, Secretary-General of Egypt's Supreme Council of Antiquities, told Ahram Online. Below the cross are five further lines of Coptic text, parts of which are broken off, rendering it more difficult to decipher. A special team of researchers, Waziri noted, will conduct further study on the lower text in an attempt to reveal its meaning. On Sunday, Egyptian archaeologists in Luxor uncovered the decorated limestone tombstone, which had been buried on the eastern side of the Avenue of the Sphinxes under Al-Mathan Bridge.